Wow! I can't believe a whole week has gone by since I last updated this blog. I really didn't have any projects to show until today so there wasn't much to say anyway! Let's see.... What's been going on here? 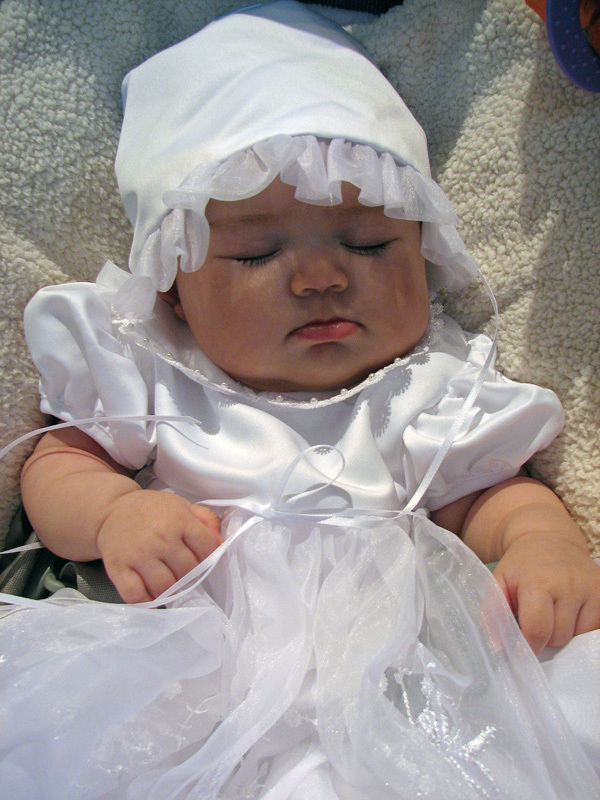 Isabel's baptism was last Sunday. She was the perfect little angel as usual. Never cried, just sat on my lap looking around. I have to say she looked adorable in her little outfit too :) I took this picture right before we got to church. And here is my new favorite picture of Frances. She looks so sweet in this photo. 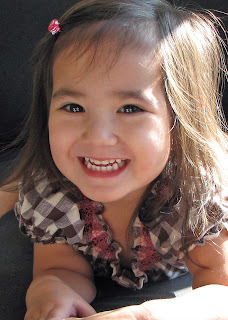 Who would guess that most of the time she is a naughty little two year old? While looking on line the other day I found this that I am absolutely in love with. I jumped up to get my credit card, then saw the price tag. $400 is a little out of my league. 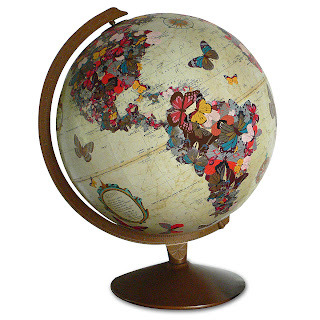 If I can find an old globe I may try to make my own version one day. You can find this one HERE. Last update for today is this "Sweet" page I created of my little Isabel. I made this one just for fun. I haven't done a layout in a long time that wasn't for a DT assignment. I used Bella Blvd's Lovey Dovey collection. It was just me and the girls this morning so I decided to dress them up and take some pictures. It sounds a lot easier than it actually is!!! 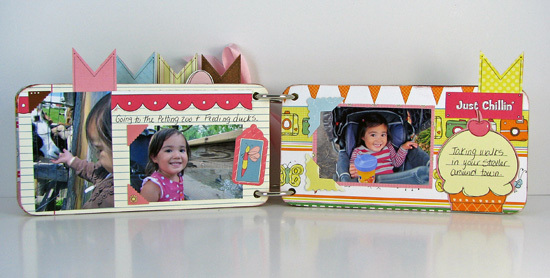 I just have the pictures of the girls today although, I have been working on lots of scrappy projects this week. 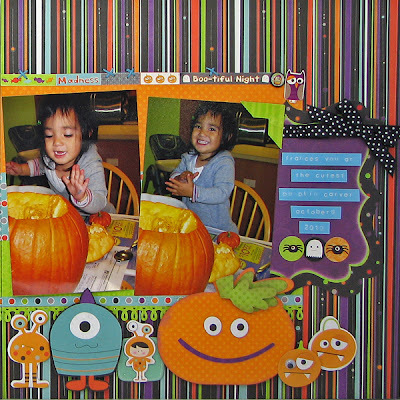 I created two layouts using some Bella Blvd Lovey Dovey paper that I had been holding onto and another with OA Campfire. I also finally dug into the February kit and made some cards with the Webster's Pages paper. 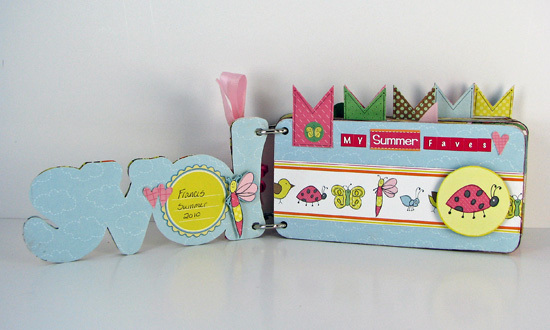 Then I cracked open the brand new Bo Bunny and worked with the Ad Lib and Gabrielle papers. They are both just amazing lines. So I will have lots to show in the next few weeks, just not right now. I also have some fun news to share in next week too! 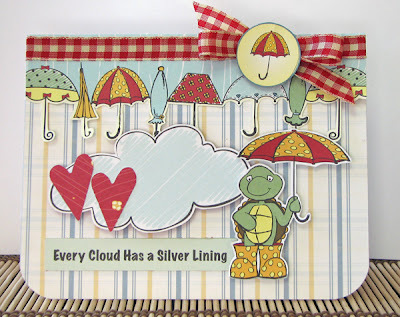 This is not only one my fave new lines from Nikki Sivils, Scrapbooker, but describes the weather perfectly here today too! After days and days of snow and temperatures in the single digits now it is raining and almost 60 degress. Go figure. Chicago weather is CRAZY! 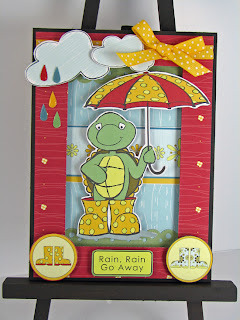 The raining theme seemed appropriate given the current conditions so I have two Rainy Day projects up on the Nikki Sivils blog today. 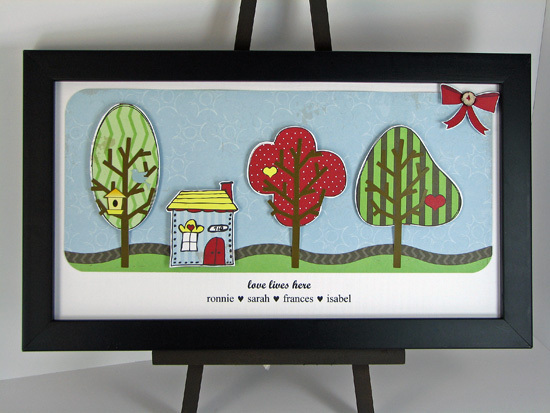 and this is a little frame I made for Frances's room. She loves singing this song (I think it has more to do with it being sung on Dora, than the fact that I sing it to her :) and she loves turtles too. When I showed it to her she said "Mom that's a turtle. I want that." And I can see why. Tubby the Turtle is adorable! Both of these projects use the Nikki Sivils It's Raining, It's Pouring line. I used the Bo Bunny Whooligans line for this layout. Still one of my favorites! I also used the Mini Monsters cricut cartridge that just so happens to be another of my favorites! Hello sweeties! 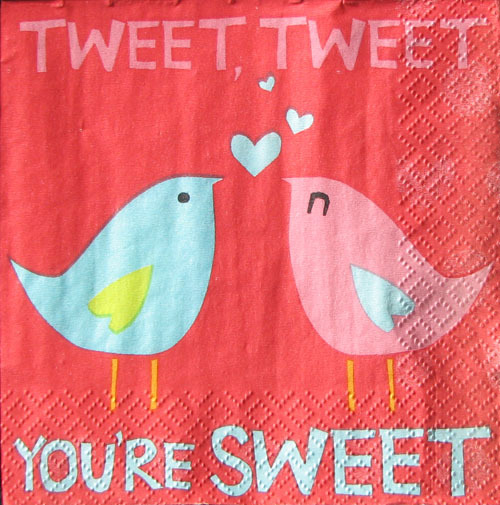 I hope everyone had a great Valentine's day! 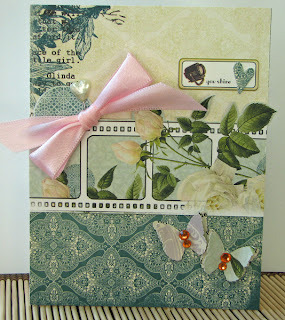 This weekend I found out that my card was chosen for the member appreciation challenge at My Scrapbook Nook. Yay!!! I don't think that I mentioned that I was chosen as a guest designer during their last design team call yet. I am super excited to be a guest dt member because their kits are the BEST! 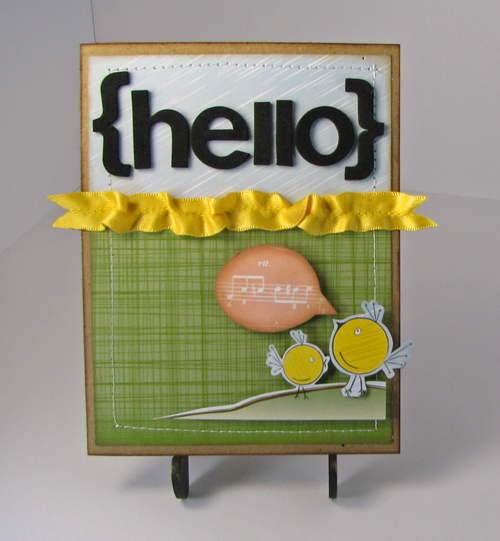 Not only was my card the inspiration, but the guest dt'ers were asked to create examples. So I was able to create an example card too. 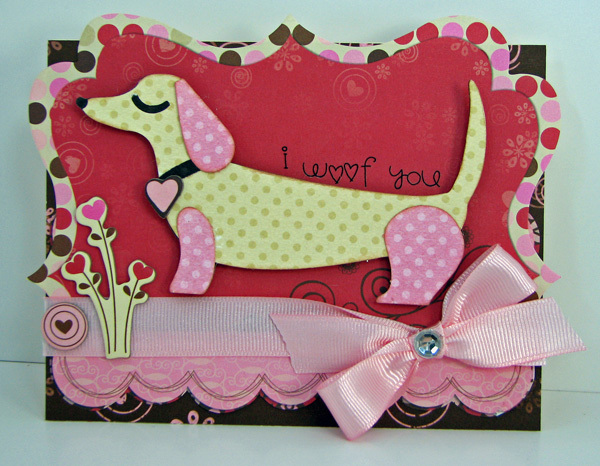 Here is the card that was chosen. I created this for Nikki Sivils using the "My Friend Birdie" line a few months ago. And herer is my lift on it. I used the February Nook kit and this was my very first time using Webster's Pages. The paper is so pretty I almost had a panic attack cutting it! Everything was from the Feb. kit except the ribbon and jewels. You can play along with this challege and see the rest of the DT's cards on the message board. I would love to see your take on the inspiration card. Here's my little Isabel wishing you a Happy Day! 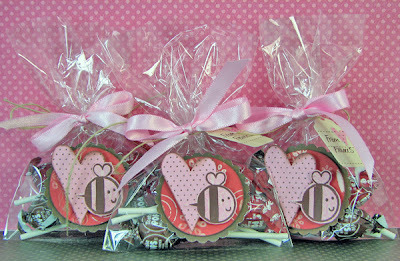 There's still time to make some super cute Valentine's treat bags for your child's classroom or Valentine's Day party. These cello treat bags can be made super quick just in time for Valentine's Day this Monday. 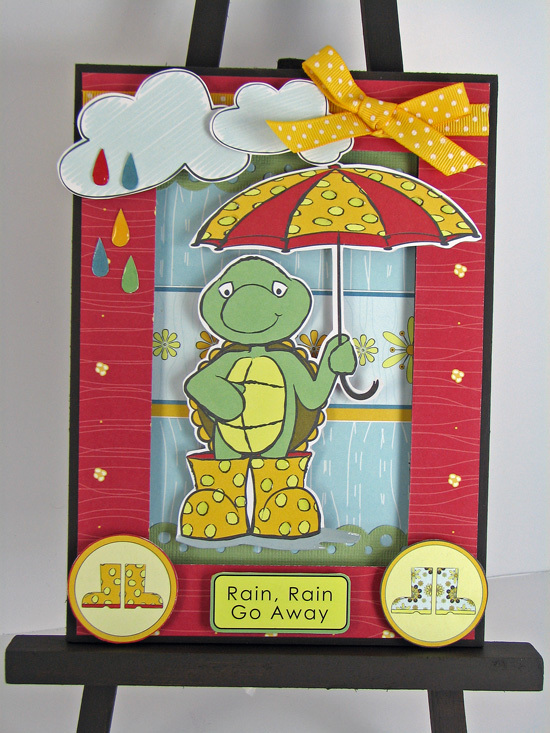 All you need is patterned paper, stamps, ink, paper punches and ribbon. That's it! 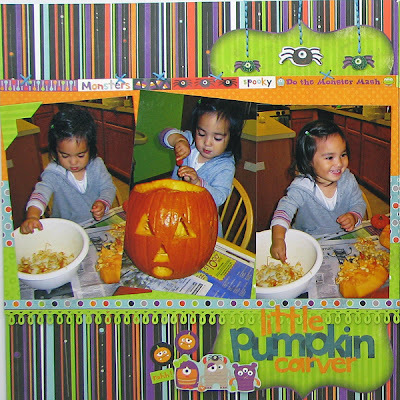 Quick and easy and the kids can help make them too! I used the Bo Bunny Crazy Love collection to decorate these bags. 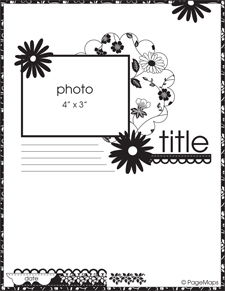 The little bee is one of the acrylic stamps that I stamped onto the patterned paper and then cut out. I punched the scalloped circles, circles, hearts and tags and then pieced everything together. Tie a ribbon and some twine to close the bag and you are done. You can see some other very cute treat ideas on this POST at the Bo Bunny blog. And you can't have a party without some napkins. 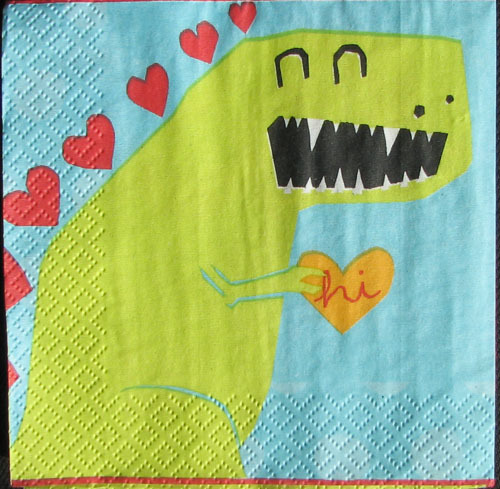 I went to a friend's house yesterday and she had these adorable napkins for her daughter's Valentine's party. They are so cute I had to take a few home for Frances. And when I opened up the napkin I got this cute surprise! I believe these are available at Target if you want to pick some up for your party. Yesterday I shared a picture of my little dinosaur. Today I have a picture of my little artist. Frances is my crafty girl. She loves all things crafty. She is constantly asking to scrapbook or decorate something. She even has Daddy scrapbooking with her when I am not home. I guess she inherited my crafty gene. Lately she has been asking to paint. I am not sure why. Maybe she saw someone doing it on tv or painted at school. So we bought her a little paint set. Here she is painting what she told me is a cat. Gotta love the imagination of a two year old! And an artisit is born! 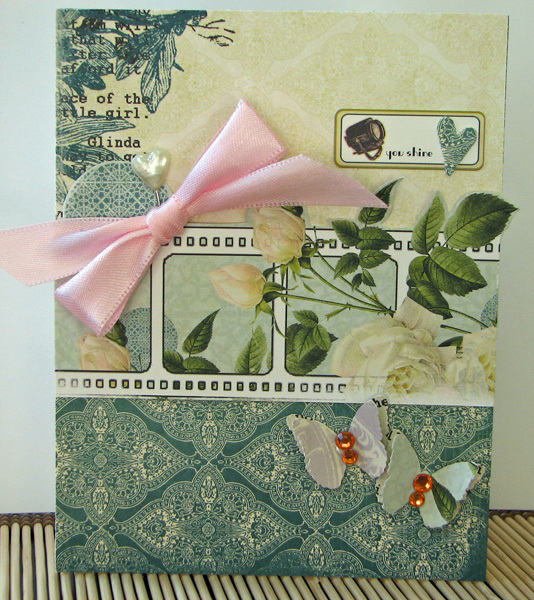 I also have a few layouts using Nikki Sivils new "Max and Mollie" collection. I just love those little skunks! Here's my little Isabel. Only a fe weeks old and smiling already. That's our happy girl! And here's the two girls together. Isabel was only a few days old here. You can't see me, but I am on the side making sure she doesn't fall over! On Saturday I got the girls all dressed up in their winter clothes and took them out for some cupcakes. We call this Isabel's Dinosaur outfit. Isn't she a cute dinosaur? Happy Friday! It is almost the weekend and I hope everyone has a great one planned. I have to do a little shopping. The regular household kind of shopping (we go through two BIG boxes of diapers A month) and for a new dress for Isabel's baptism. It is in a few weeks and I am getting nervous because I still have nothing to wear. My husband suggested wearing one of the 'many' dresses I already have in my closet, but obviously he has never had a baby because then he would know that none of that stuff fits and by the way, thanks for bringing it up. Things are great here and we are enjoying spending time with our two wonderful girls. Here is a simple altered frame I made with the brand new Nikki Sivils Scrapbooker line "We are Family" that pretty much sums up exactly how I feel. supplies: Nikki Sivils We are Family patterned paper, pocket full of stickers and burlap buttons. I bought the frame at Michaels. It is actually a frame to hold a CD. I just the insert out that you would put the CD into and then cut white cardstock to fit. I measured the cardstock and then set the page settings in microsoft word to that size to print my journaling. I practiced on white sheet of paper first though to make sure it would line up. 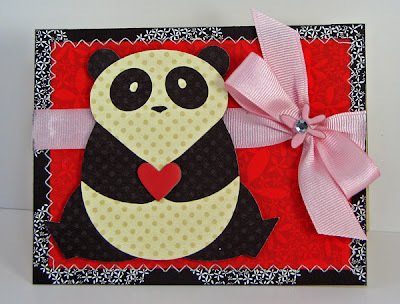 Today is Valentine's Card Day on the Bo Bunny blog. I made two cards to give to my little girls. This first one is for Frances. She is addicted to Pandas right now. I made this one for Isabel. We have two dachshunds to I thought this little guy was perfect. Yesterday I received the February Pagemaps newsletter in the email. I was super excited because the Nikki Sivils DT was asked to contribute for February and I was one of the lucky girls to create a layout. I received this sketch from Becky and I love it! I was so happy to be able to contribute I volunteered for any size. 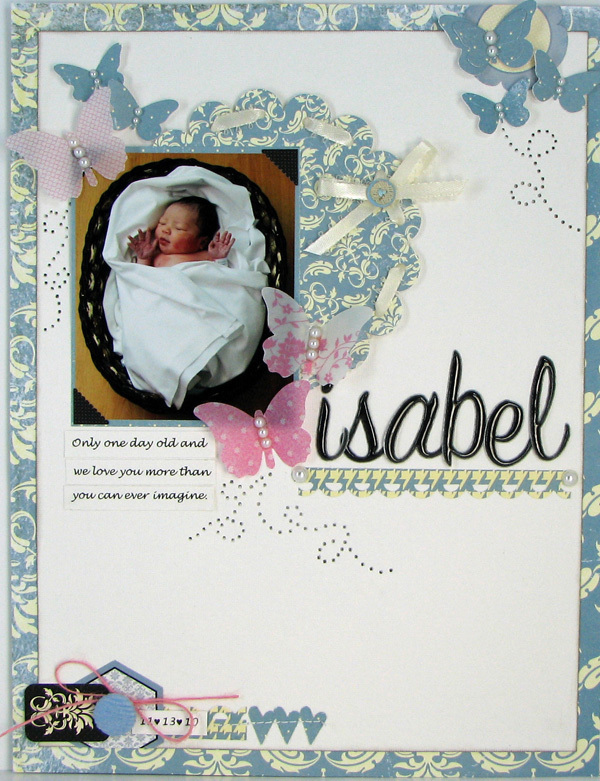 This was my first time making an 8 1/2 x 11 page, but I didn't mind because Isabel's baby book is this size. I created this layout for the front page of her book. Lastly the other day I received this super sweet blog award from Paula, aka 'The Scrapbook Speedway'. I can't thank her enough for thinking about me and am more appreciative than she knows. You have to check out her blog too because she is one awesome scrapper! 1. I love Chai Lattes. I could drink them every morning if they weren't so darn expensive. 2. I love to watch tv. My DVR is always at 99% though because unfortunately I have no time to watch tv. 3. My dream vacation is to go to Alaska. 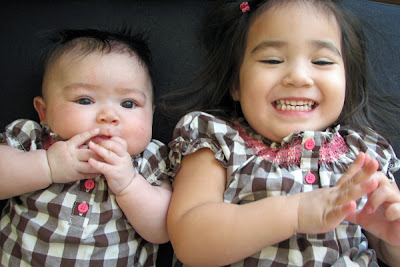 I will make there one day when the girls are older. 4. Pizza is my favorite food and I could eat it everyday. My favorite pizza topping? Pepperoni and spinach of course. 5. Frances was my grandmother's name and is also the patron saint of animals. I love animals and my grandmother took care of me as a little girl. That is where my Frances gets her name. 6. I am terrified of elevators. I will always take the stairs if I have a choice. 7. I go to bed around 9pm every night. I would go to bed earlier if I could, but Frances doesn't always cooperate. 8. I am only 5 feet tall. Yep, I am very short! The shortest in my family. Except for my Grandmother who was shorter than me. 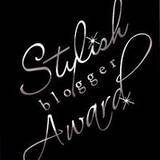 Now I am supposed to pass this on to 8 other bloggers, but honestly I can't choose! So let me think about this a little more. A mini album and a frame. Hello all. Are you getting ready for the blizzard too? In Chicago it is supposed to snow 18 to 24 inches in under 24 hours. YIKES! That's a lot of snow! All the schools are closing early and will be closed tomorrow, plus lots of businesses are doing the same. I am kind of torn about this. I am tired of shoveling and driving in snow, but it will be fun to stay home tomorrow and play in the snow. I remember making snow forts and having snowball fights when school was cancelled and it was so fun! Plus Frances keeps asking to go out in the snow to play so tomorrow may be the perfect day. All this talk of snow has be thinking about summer again. Are all these posts starting to sound the same??? I just can't help it. I love summer and can't wait to get outside again. I created this little mini-album of all the things Frances loves to do in the summer. 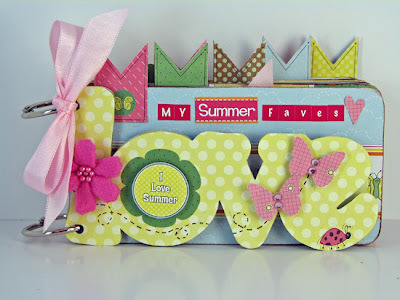 I used the Nikki Sivils Scrapbooker "Summer" line and a Maya Road chipboard mini-album. The pink flowers are from Maya Road too. This was really fun to make and the "Summer" papers have so many cute little sayings and critters. I also have one other project to share today. This altered frame I made is on the Nikki Sivils blog today. It is currently on display in her booth at CHA. 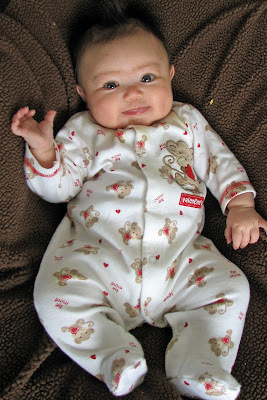 The picture is of my sweet baby girl Isabel only one day old. 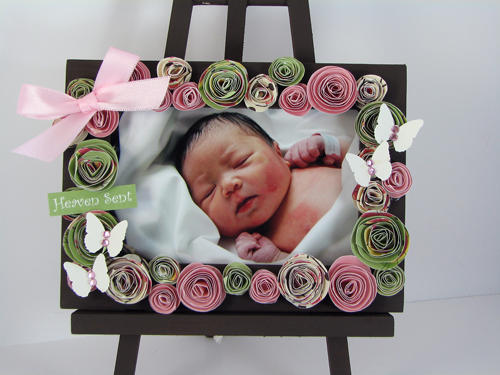 I used the "Max and Mollie" collection to make all the flowers, punched some butterflies and then cut out the 'Heaven Sent' sentiment from the cut ups paper. She is heaven sent for sure. The frame and easle are from IKEA. They come infinished so I just painted them with some brown acrylic paint. They are only a dollar each too! Thanks for stopping by today. If there is snow expected by you stay safe!